Hacker’s don’t clock out at the same time you leave work for the day. Cyber security is a 24x7x365 type of job that requires a hybrid on- and off-site approach to gain comprehensive security, and we’re dedicated to helping your business achieve it. 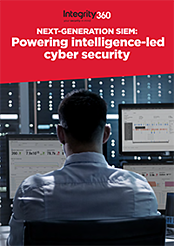 Our new eBook explores next-generation Security Information and Event Management (SIEM) tools and the impact they’re having on companies’ cyber security strategies. Find out more by filling out the form below.